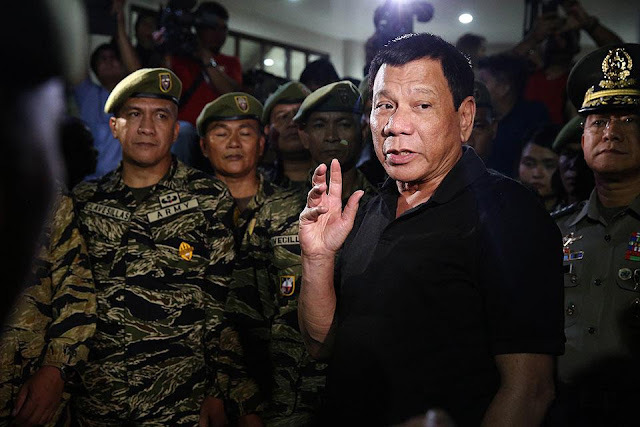 MANILA -- President Rodrigo R. Duterte on Thursday promised to continue his relentless fight against corruption and illegal drugs, which reduced crime rate by 49 percent. “Pero basta ‘yung pangako ko (But my promise) stays. No corruption, walang (no) drugs or minimized at least by 49 percent ngayon (now). Wala na masyado ‘yung saksakan (No so much killings now),” Duterte said during the oath-taking of the new Career Executive Service (CESOs) and awarding of 2018 outstanding public servants at the Malacañang Palace. Based on the latest government’s #RealNumbersPH data, the Philippine Drug Enforcement Agency and Philippine National Police have already conducted 99,485 anti-drug operations, resulting in the arrest of 143,335 personalities since government's war on drugs began in mid-2016. More than 4,200 drug personalities have died in legitimate drug operations while 2,678 kilograms of shabu worth PHP14.34 billion have been seized. The total value of seized drugs, controlled precursors and essential chemicals and laboratory equipment has reached over PHP20 billion while authorities have dismantled over 180 dens and 12 clandestine laboratories. Duterte added that drug dependents have become skinny due to the effects of “shabu” methamphetamine). “Alam mo bakit payat 'yan sila? Hindi 'yan sila kumakain. (You why they are thin? They are not eating). And they keep on grinding their teeth na parang sa dream na gumaganun (like in a dream). ‘Pag ka ‘yung anak niyo sige ganun(If your son is doing that), it's a red flag,” he warned. Despite the reduction of drug-related crimes, Duterte vowed to protect the people particularly minors from the epidemic of illegal drugs. Duterte hit a recent Social Weather Station (SWS) survey which showed six of 10 adult Filipinos said ‘Oplan Tambay’ or campaign against idlers is a violation of human rights. “Sinasabi sa survey they consider it a violation of their human rights. B*** s***,” Duterte said. “You know, if you are a minor, the parents patriae comes in. I can take you out especially now with the epidemic of drugs and everything. I can take you into custody of the law or by law and keep you somewhere to protect you. You are not being arrested. You are not being driven way. But a curfew for the minors, it’s really good for you,” he added. Meanwhile, Duterte warned that the present level of governance will never rise if there is no law and order and corruption persists. He said the presence of corruption in almost every government transaction has prompted him to express in a recent joint military and police command conference, his intention to step down. “It seems that ang transaksyon nang lahat sa gobyerno meron talaga. Maski saan magtingin meron and all – dito sa national pati sa local. (It seems that the transactions of all government has corruption. anywhere you see in the national and local),” Duterte said. Duterte reiterated his resolve to fight corruption as well as criminality and illegal drugs until the last day of his administration. He urged the CESOs and awardees to be models of good public servants and join his crusade against graft and corruption.